For many website owners, a majority of their marketing budget is applied toward attracting new traffic, with little thought about what happens once the visitor gets to the website. This was the case with Appaloosa-Store, according to its Co-Founder and General Manager Julien Ott, until Kissmetrics Analytics started helping it collect essential data. When it added the new Engage product from Kissmetrics, Appaloosa-Store saw a 750 percent lift in conversions by running a notification to display a flash sale. Engage is a brand new conversion optimization product that, when used in combination with Kissmetrics’ flagship product Analyze, can help increase conversion rates by optimizing every website interaction based on behavioral triggers. Those interested in the Engage product should know it appears quite simple to use. 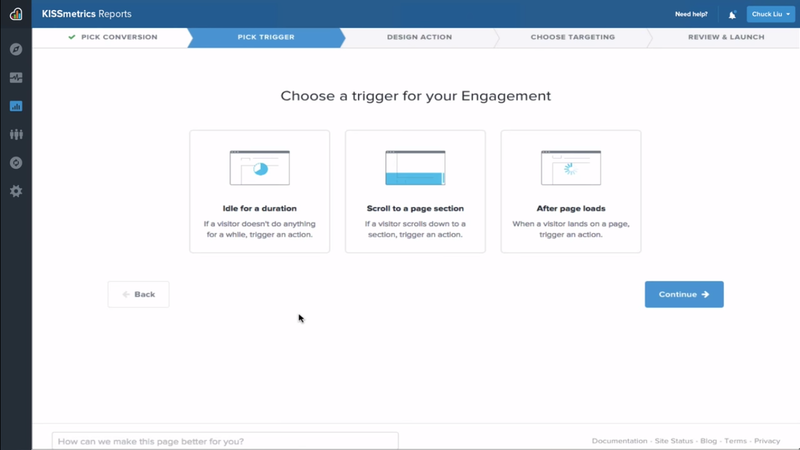 To start, a user chooses which behavior they’d like to target: idle for duration (if a visitor doesn’t do anything for a while, trigger an action; scroll to a page section (if a visitor scrolls down to a section, trigger an action); and after page loads (when a visitor lands on a page, trigger an action). These triggers are meant to decrease page abandonment and increase engagement and conversions by offering relevant messaging, in the moment. Once the behavior a company wants to target has been chosen, the marketer can select from five engagement styles. According to Kissmetrics, Lightbox and Popup are designed to reduce abandonment, while Bumper and Notification are to keep people engaged. Lastly, Bar can be used for flash promotions (as was the case with the previously mentioned Appaloosa-Store), coupon codes (see image) or even just a welcome message. After the behavior and engagement style has been chosen, the marketer selects who sees the engagement campaign, like the channel someone came in from (direct, organic search, paid search, social, email or referral). He or she can also target where on the site they want the engagement to occur, such as pricing pages, product pages, every page. They can also target how often the message is shown, like only once, once per visit or until the visitor interacts. Further, marketers can A/B test the engagement to ensure they have the most optimal creative for the audience segment. Once the campaign is named, Engage users then choose to run the campaign immediately or schedule it in advance. As the campaign is rolled out, marketers can then view the analytics to see how many views the engagement received, how many people dismissed it, clicked on it, etc. For anyone looking to keep visitors on their site through timely messages based on behavior, Engage is certainly worth a digital look.